We are providing the Generator Maintenance Services. We Will Provide Service & Repairing of R F Genrator (Induction Heating). We will do all types of maintenance of R F Genrator (Induction Heating) and cards repairing with minimum maintenance charges. We are engaged in providing service of DG Set Synchronizing Panel. These panels are available with controlling and protection relays, which have the capacity to synchronize more than one DG sets and Mains & DG. We are also engaged in providing 24/7 Electrical Services for all electrical power systems, DG sets for various critical Industries. Our team is well versed with maintenance, trouble shooting and pro-active maintenance schedules thus fulfilling the needs and demands of the customers in the best possible manner. These AMC services enabled our customers to get the service done at nominal cost. We provide operators for operating DG SETS. We take yearly based contract for all type of generator sets including maintenance & operation. We are instrumental in providing a wide range of Caterpillar Repairing service for our esteemed clients that cost very reasonable amount. The offered service is highly acknowledged among our clients due to features such as promptness, reliability and cost-effectiveness. These services are executed using latest tools and with the help of our experienced team. Repair & Retrofit Services: Building Fabric, HVAC System (High Side, Low Side) Electrical Distribution System Backup power systems ( DG Systems, UPS Systems) Mechanical Systems Plumbing System Building Automation system Fire Alarm System Security & Surveillance Systems. YESHA Manufactures DC Capacitors, since mid sixties, in wide ranges that solve the problems of various DC applications, such as thyristor protection, communication, filtering, bypass, coupling etc. We provide complete care of your Gensets on regular basis. We provide the Operation and maintenance services to all brands and capacities of Gensets at best rates in the industry. As we have a dedicated unit of staff and infrastructure for the complete care for Gensets, we can offer you the best service at the most competitive rates. 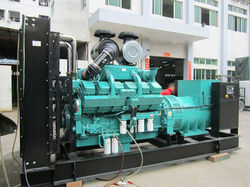 We are offering a wide range of Generator Maintenance Service to our clients.